3 Keys To Get Rid Of Unwanted Cellulite. This is not about some special laser Brittany spears has used to “ZAP” away the cellulite. This is not a Network Marketing scheme to get you to buy a new and improved cream to rub all over your legs. These are scientifically proven (non-surgical) ways to reduce the appearance of cellulite. I said reduce – not DISAPEAR – I can’t guarantee that – so don’t paint me into a corner. Sometimes they will disappear and sometimes they will dissipate. Genetics plays more of a roll than you think. Intense Strength training. This includes all modalities of EXERCISE. Lifting for strength, some hypertrophy and endurance. It must be intense. Ridiculously great SLEEP. I have beat this over the head so many times. You want to reduce the estrogenic effect of our lives, NOTHING beats proper sleep. If I had to choose just two, SLEEP and Nutrition, because they make up the majority of our days. As far as exercises, some modalities work better than others, and that your genetics will make a difference. 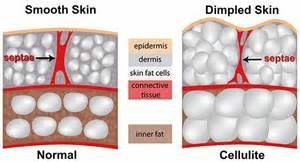 But if you follow all of these pieces, you can and will dramatically reduce your cellulite appearance. Let me be clear, long slow walks on the beach, the long cardio walk to nowhere and lifting light weights will not cut it. Whatever health magazine you read that is preaching this type of nonsense is WRONG. They are telling you what you want to hear. I know it may be hard, but you have to think of your goal and what the end result will feel like. This is what needs to drive you. Your nightly BOTTLE of WINE will not be required.